[263 Pages Report] The global eHealth market is projected to reach USD 132.35 Billion by 2023 from USD 40.82 Billion in 2017, at a CAGR of 22.7% from 2018 to 2023. The growth of the market can be attributed to factors such as, the need to curtail escalating healthcare costs, increasing government initiatives supporting the use of eHealth solutions and services, the shortage of healthcare professionals, high prevalence of chronic diseases, growing need to manage regulatory compliance through the use of eHealth solutions, and shift towards patient-centric healthcare delivery. Top-down and bottom-up approaches were used to validate the size of the global eHealth market and estimate the size of various other dependent submarkets. Major players in the market were identified through secondary sources secondary sources; directories; databases such as Hoovers, Bloomberg Businessweek, Factiva, and OneSource, journals and associations such as American Health Information Management Association, Ohio Health Information Management Association and their market revenues were determined through primary and secondary research. Secondary research included the study of the annual and financial reports of top market players, whereas primary research included extensive interviews with the key opinion leaders such as CEOs, directors, and marketing executives. The percentage splits, shares, and breakdowns of the product markets were determined using secondary sources and verified through primary sources. All possible parameters that affect the market covered in this research study have been accounted for, viewed in extensive detail, verified through primary research, and analyzed to get the final quantitative and qualitative data. This data is consolidated and added with detailed inputs and analysis from MarketsandMarkets and presented in this report. The global eHealth market is fragmented and highly-competitive in nature, which consists of several large to medium-sized companies that compete with each other for increasing their foothold in different segments of the market. The top five players operating in this market include Cerner (US), McKesson (US), Philips Healthcare (Netherlands), GE Healthcare (US), and Allscripts (US). Other leading players in this market include athenahealth (US), Epic Systems (US), IBM (US), Optum (US), Siemens Healthineers (Germany), Medtronic (Ireland), and Cisco Systems (US). The eHealth market has numerous small players operating at both global and regional levels as well. The leading players are continuously developing new and innovative services to maintain their shares in the eHealth market. The global eHealth is projected to reach USD 132.35 Billion by 2023 from USD 47.60 Billion in 2018, at a CAGR of 22.7% during the forecast period. The growth of the market can be attributed to the increasing government initiatives supporting the use of eHealth solutions and services, high prevalence of chronic diseases, growing need to manage regulatory compliance through the use of eHealth solutions, need to curtail escalating healthcare costs, shift towards patient-centric healthcare delivery, shortage of healthcare professionals, and rising usage of big data. The eHealth market in this report is segmented on the basis of product & service and end user. This report also provides market information on major regional segments, namely, North America, Europe, Asia Pacific, and the Rest of the World. Based on product and service, the eHealth solutions dominated the eHealth market in 2017. The large share of the eHealth solutions market can be attributed to the growing digitization in the health continuum, increased adoption rate in emerging countries, rising government funding, ancillary government initiatives promoting the use of eHealth solutions in healthcare systems, and increasing need to curtail healthcare costs while delivering quality patient care. By type, the EMR/EHR solutions segment accounted for the largest share of the eHealth solutions market in 2017. Supportive government initiatives for EMR implementation across the globe, growing consolidation among healthcare providers, rise in digital and connected healthcare technologies, and increased government incentives are the key factors supporting the growth of this market. By type, the remote monitoring services segment dominated the eHealth services market in 2017. 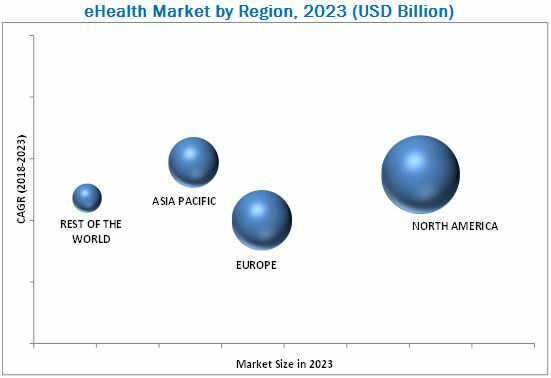 The large share of this market is mainly attributed to the rising prevalence of chronic diseases and lifestyle disorders, increasing geriatric population, and high preference for home healthcare and rehabilitation due to the convenience of the services. On the basis of end user, the global eHealth market is segmented into healthcare providers, pharmacies, healthcare payers, healthcare consumers, and other end users. In 2017, the healthcare providers segment accounted for the largest share of the global eHealth market. The growth in this end-user segment can be attributed to factors such as the improving healthcare infrastructure in Asia Pacific, rising need to curtail healthcare costs, and improving patient and financial outcomes. In 2017, North America dominated the global eHealth market. The growth in this market can mainly be attributed to the strong IT infrastructure in the region, increasing investments and regulatory mandates favoring the implementation of eHealth solutions, presence of large healthcare IT companies, and rising utilization of remote patient monitoring solutions and services for the management of prevalent chronic diseases and lifestyle disorders. The Asia Pacific region is expected to grow at the highest CAGR during the forecast period. High growth in the Asia Pacific region is largely driven by government investments & reforms to modernize healthcare systems, rising medical tourism, implementation of eHealth programs, and increasing per capita income in this region. However, factors such as reluctance among medical professionals to adopt advanced eHealth solutions and high-cost of deployment and maintenance of eHealth solutions are likely to hinder the growth of the global eHealth market to some extent. The players in the eHealth market include Allscripts (US), athenahealth (US), Epic Systems (US), IBM (US), GE Healthcare (US), Cerner (US), Optum (US), Philips (Netherlands), Siemens Healthineers (Germany), McKesson (US), Medtronic (Ireland), and Cisco Systems (US).